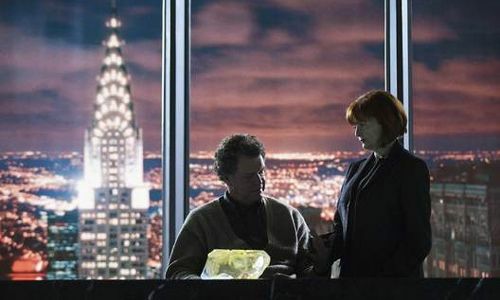 Cultural Wormhole: Fringe - "6B"
Walter (John Noble) discusses his fears of becoming like his alternate reality counterpart with Nina (Blair Brown). It would seem that we're in a section of the season that continues to deal with the events of the first eight episodes, while attempting to move pieces into place for the run up to the season finale. While the post hiatus episodes have reflected more of a Monster of the Week vibe, the creators of 'Fringe' have made sure to balance them with a heavy dose of mythology and character development. As a result, even these more standalone type of hours certainly feel like they are vital parts of the overall show tapestry. In last week's Alt-Fringe centric story, Walternate was beginning to question the whether or not he has been too extreme in his methodology in his attempts to safeguard his world. While he has come across as a "by any means necessary" sort of figure, he does draw the line at experimenting on children. This is a line that we know our Walter crossed several decades ago with the development of Cortexiphan. This week we get a bit of a flip-side to that theme. When faced with a possible vortex event on our side of the dimensional barrier, Walter debates if the use of amber is justified. His fear is if he begins using Walternate's tools, he will start down the road to becoming the man who he sees as his enemy and an extremist. Yet, the damage of a potential vortex is quite possible. Is the cure just as deadly? We're also at a point in the series where we're beginning to see some callbacks to the early days of 'Fringe'. Olivia's return to our world came via the sensory deprivation tank she used in the series premiere. In "6B", Walter recreates the amber based on the case notes and samples extracted from the bus attack at the beginning of season one. This helps give the series an overall feeling of continuity. I'm not so sure if I'm crazy about a rift between worlds being created by two people's mutual grief. Granted this is a special case where the circumstances probably had to be perfect such as the deaths were of the opposite spouse and at the same time. Still, it was the type of emotionally charged situation that would cause Olivia and Peter to reexamine their relationship. I'm very happy that we've got some sort of resolution to emotional rift between Olivia and Peter. I think it went on long enough. Anymore and we would have fell into another version of the television "will they or won't they" debacle.﻿ Plus, these two finally taking a chance on romance will further complicated things oh so nicely when Fauxlivia shows up with Peter Jr.